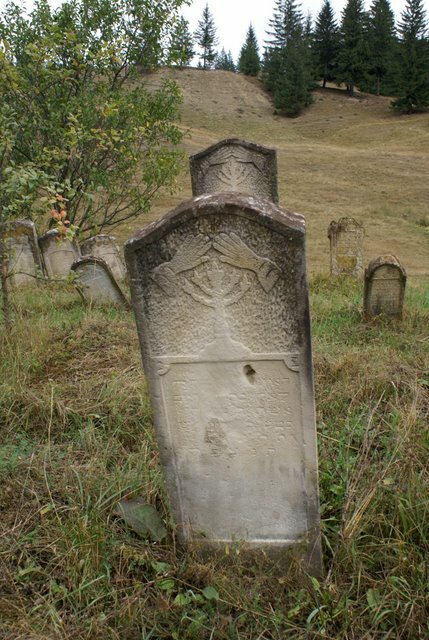 Candlesticks on tombstones come in many types and styles. They range from what I would call “classic” Shabbos candles — two matched candles in individual candle-holders — to multi-branched candelabra (including seven-branched menorahs) of various types. Some of them look as if they could have come off of a household’s shelf. 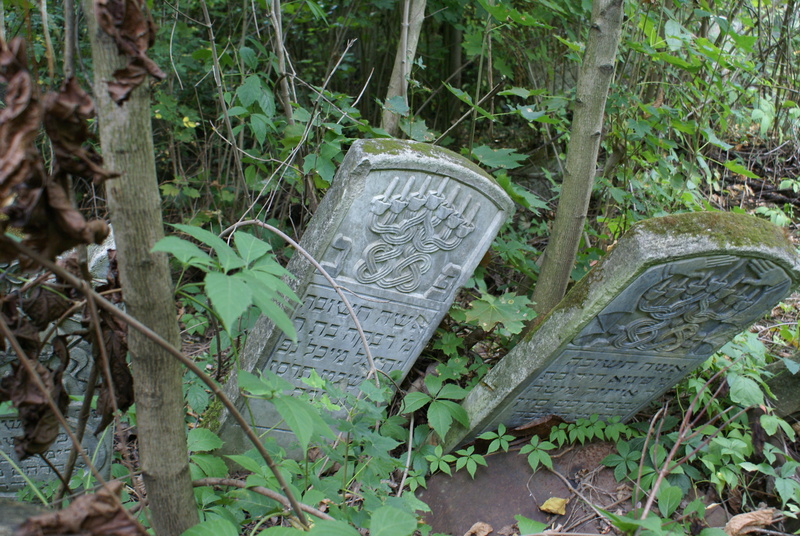 Others look like classic Menorahs of antiquity, which were made following the instructions by God in Exodus 25:31-32. Many candlesticks are elaborately ornamental but still look like physical objects. But others still are intricate figures that weave and twist and entwine the branches of the menorah and/or the base of the menorah into fanciful convoluted forms. 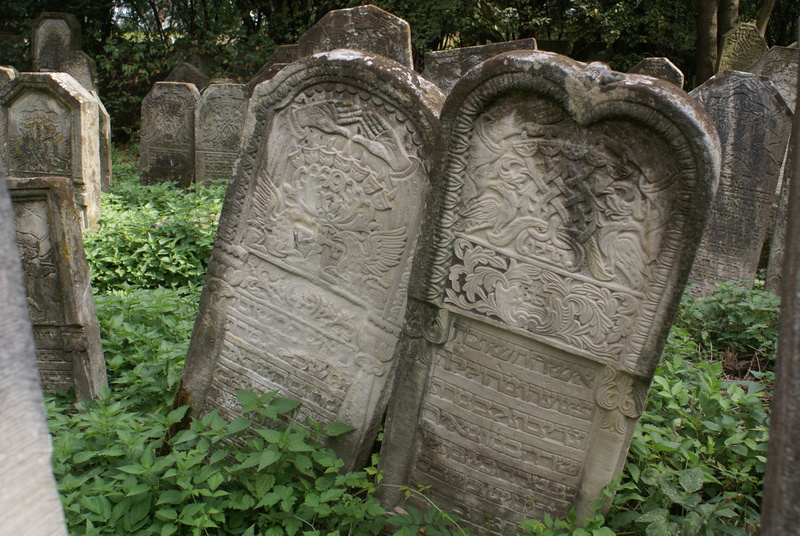 And some clearly combine the imagery of the Menorah with that of the Tree of Life — or, perhaps, of death, as in some examples the branches of the menorah may look like snakes. Some stones bear images of hands blessing the flames. In their fascinating and wonderful book Traditional Jewish Papercuts: An Inner World of Art and Symbol (Hanover NH, 2002), Joseph and Yehudit Shadur write that the intricately convoluted menorah forms appear almost exclusively in two places — in traditional East European Jewish paper cuts (where they are often dominant compositional elements) and on some East European Jewish tombstones. They appear to represent a development of the “endless knot” motif. As far as we could ascertain, neither the convoluted menorah configurations nor the endless-knot motif have ever been considered as distinct visual symbols in Jewish iconography. And yet, they are so common and figure so prominently in East-European Jewish papercuts that they can hardly be regarded as mere decorative motifs. 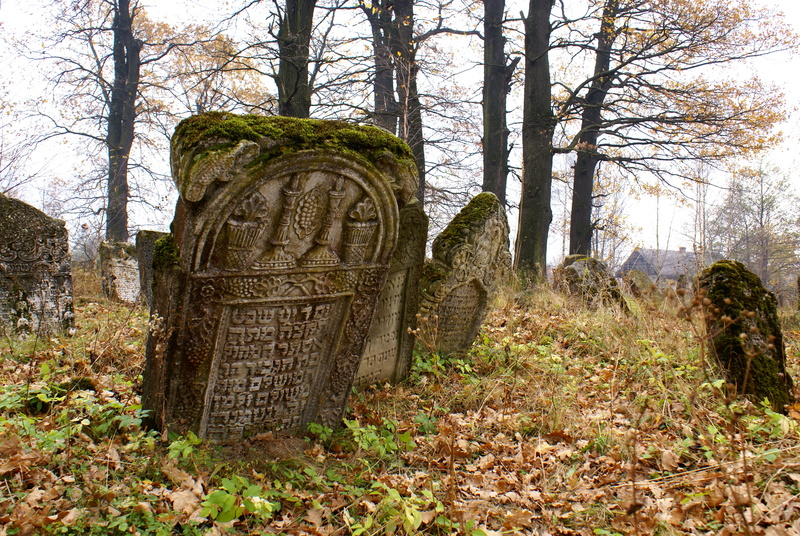 In her book A Tribe of Stones, Jewish Cemeteries in Poland (Warsaw 1994) Monika Krajewska, a post-World War II pioneer in the study of gravestone imagery — who is also an accomplished paper-cut artist, likens the twisted menorahs to the braiding of Challah loaves — and in a way, that would mean that the images denote two of the three “women’s commandments” (lighting the Shabbos candles, “taking Challah” or removing a piece of dough when baking bread, and Niddah, or keeping menstrual purity). On this page I post examples of various different forms. You can see many more in the photo galleries on this site. Gura Humorului, Romania, September 2009. 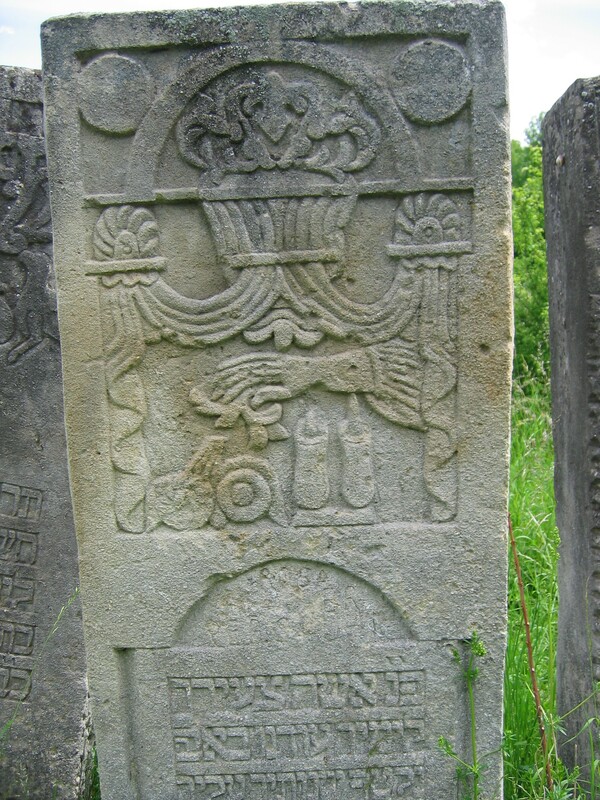 A very simple stone, showing hands blessing a five-branched candelabra. 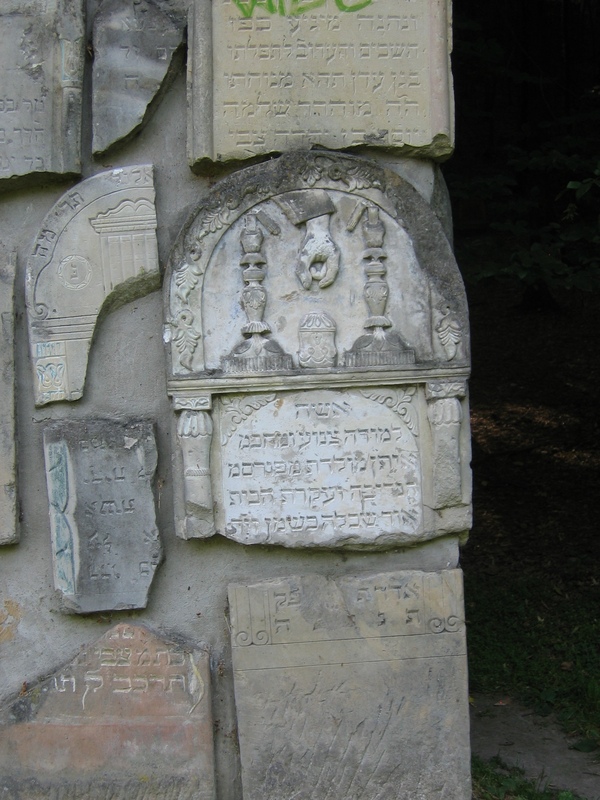 The stone to the rear was clearly carved by the same artist. Old Cemetery, Siret. 2006. Candlesticks appear to become the Tree of Life. 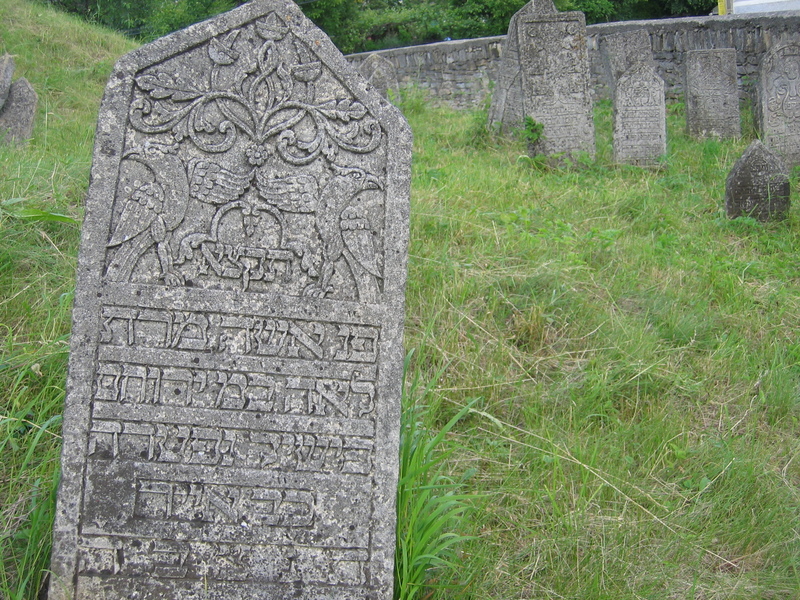 Radauti, Romania, 2009. 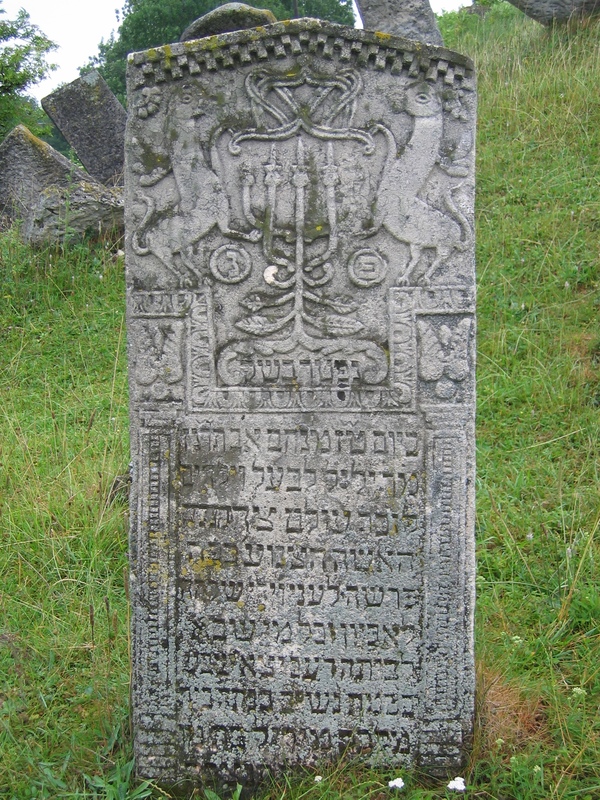 Candlesticks/Menorahs whose branches are braided and flanked by birds or griffons. Botosani, Romania, 2009. The "endless knot"